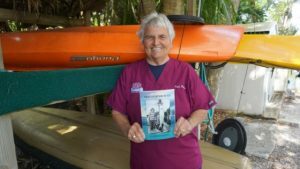 Meet local author Captain Marian Schneider at a book signing at The Englewood Chamber of Commerce. Captain Marian will be signing copies of her book “There’s a Captain in You” beginning at 11am on February 26th. Known for launching Eco-tourism and recreational kayaking in Charlotte County, she now hopes to teach others to take the helm of their own lives. “What I wanted in this book is to inspire someone who has a dream or a passion to follow it”. Captain Marian, who operated Grande Tours in Placida for more than 25 years, was inducted into the Charlotte County Tourism Hall of Fame. The honor recognizes those who have had a substantial and long-standing body of work that has positively impacted tourism in Charlotte County. Don’t miss this opportunity to meet a true treasure who grew up in the area and will inspire you to find the Captain in you!